For your consideration is this early set of four Warren McArthur chairs. Warren McArthur pieces form many bridges from Machine Age to Bauhaus to Artdeco to Mid-Century Modern design. 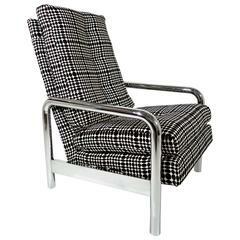 Born in the late 19th century he was an early innovator of tubular furniture construction. The chairs have been recovered in top grade marine vinyl. The perfect Midcentury eames wire chair for Herman Miller. The optional blue cover is in near perfect condition. It rare to find an Eames wire chair in such Fine condition. Original period turquoise upholstery Labels below. Aluminum and leather lounges by Warren McArthur for Namco. Restored with spinney back leather.